WordPress isn’t only a blogging platform. It’s more than that. So running a WordPress site or blog isn’t an easy game. You have to take care of content, website’s marketing, social media and many more. However, you can only do these works if your WordPress is functioning firmly and your WordPress hosting provider isn’t giving you any burdens. Managed hosting in WordPress is like having your personal tech team. It’s a hosting solution that is tailor-made (and super optimized) for WordPress sites. The best thing about managed hosting? It takes care of all the technical issues behind the scenes, so you can focus on growing your site. Why is Manage WordPress Hosting Important? As the server is dedicated to WordPress websites, it gives you speedy access even during peak traffic times. Managed web hosting service for WordPress has a tight security layer. It continuously scans for malware by blocking all hacking attempts. So, the service is almost entirely hack-free. It works massively on security. It takes care of hardening WordPress and looks for new vulnerabilities on your behalf. If you do get hacked, many of them (like WP Engine) will fix the issue for free. Unlike regular web hosting service providers, the staff available for WordPress are experts in their field and provide you with much quicker and efficient solutions for your problems. They employ experts in not just servers, but also PHP, MySQL, and WordPress itself. WordPress experts staff work on their support lines, so their team can help you troubleshoot issues at every level of your website’s software stack. They create backups on a daily basis. So, you can request restore to a previous version. All updates are done automatically. So, you don’t have to bother about keeping the site updated for SEO or any other purposes. Your website won’t go down because of the traffic. The web hosts will be able to bear no matter how much traffic is being pushed through your site. The development tools will often vary by the service provider you use. But commonly you get tools like version control or staging area, etc. WPEngine hosting is one of the best-managed hosting provider available out there. Price will be a little bit higher compared to other managed hosting providers because the company maintains providing excellent support, fast loading times, and more secure servers. It also has a one-click backup and restores process included in all plans. They will scan and monitor for hacking attempts. If your site does get hacked, the company will fix it for free. The entry-level option, ‘Personal’ is generous, offering a staging environment, one-click backup, and free site migration. It can handle up to 25,000 visitors/month, but you’ll have to upgrade to unlock more resources and 24/7 phone support. Flywheel has made their way top very quickly. There is a super-cheap entry option at $15, but the real value lies in their pro packages. Paying a little extra will unlock intelligent features designed to improve workflow with clients such as bill transfer, collaboration, and staging. FlyWheel is an excellent choice for non-developers who want to launch a WordPress site and make sure that it’s going to work with no interruptions. Conceivably great for designers, small business owners, freelancers, bloggers, and all non-technical people in general. Cloudways is one of the few companies that offer a great balance between affordability and high functionality when it comes to cloud-based managed WordPress hosting. They deliver fully managed hosting with a promise of fast loading WordPress websites and no more hosting headaches. Cloudways also comes with some fantastic feature sets, so you can scale hosting resources as your website grows. They are optimized for performance, speed, and security. They offer managed cloud-hosting services on a cloud server where multiple copies of your content will be replicated throughout your chosen data center. A sophisticated algorithm handles the switching of data. If your primary server goes down, a copy of your website is served from the available server. SiteGround is one of the most popular options for WordPress because of its competitive prices. It often knocks some unmanaged services in this aspect. It’s technically a shared WordPress host. But, it manages to include some number of managed features, even on its cheapest plan. This potent blend of essential functions at low costs makes SiteGround one of the most prominent hosts out there. SiteGround is also an official wordpress.org recommended hosting service. However, much like other budget-focused hosts, the platform doesn’t support month-to-month payments, so you’ll have to sign up for a year at minimum. It’s a good idea, as you’ll be committed to your project. Overall, is an excellent option for WordPress hosting. 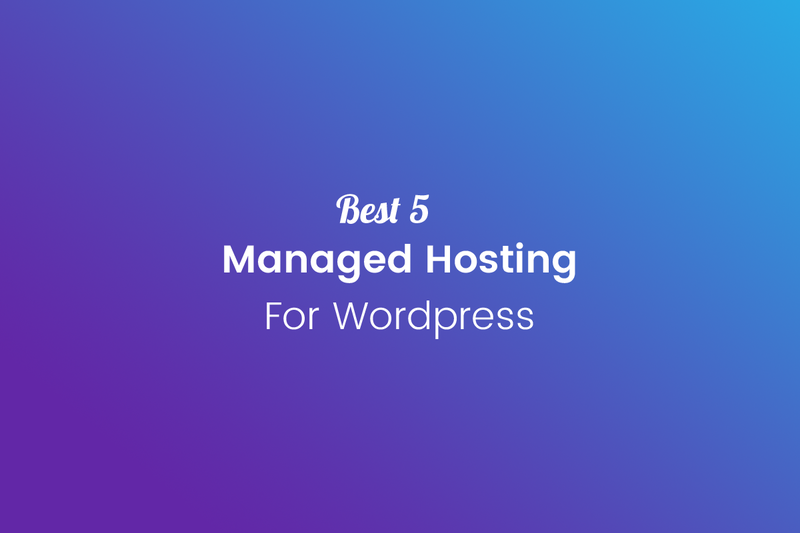 Pagely is an excellent managed WordPress host who allows you to have unlimited visits to your site like Kinsta. Amazon Cloud powers its robust server architecture. This will enable you to have the same redundancy, scalability, and best-in-class performance like the biggest brands in the world without having any of the technical details. They have seven different plans which make it easy to pick the one that matches you. But make sure you choose the one that gives you enough bandwidth, or you can always add more bandwidth as you need. It handles all technical stuff like PressArmor security, daily backups, automatic updates, and other stuff so you can focus on your business. They also have world-class support provided by WordPress experts. This is why brands like Microsoft, Facebook, Twitter, Vonage, and thousands of other trust them.